Every spring, I pull out my worn copy of Spring in Washington, Louis Halle’s 1947 tribute to nature’s unfolding along the Potomac River. Halle biked from Washington, D.C., in the early morning and explored the multiple “layers” of the outside world, including the marsh. He observed that the news media reported the arrival of “a French functionary,” but not the arrival of birds like phoebes, thrushes and marsh wrens. He celebrated the “invisible orchestra,” birds “coming in chorus from every direction.” After his “winter hibernation,” he commented, that he “had forgotten the immeasurable richness and continuance of life. This recollected smell of fresh loam in my nostrils is the smell of eternity itself,” he wrote. So, let’s all go out and smell! Spring brings more than olfactory excitement in Dyke Marsh. 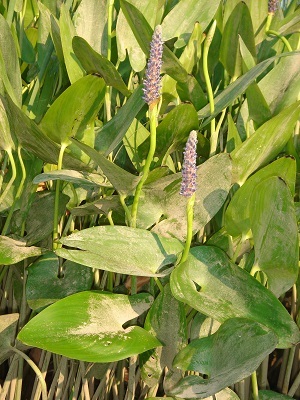 Spatterdock and pickerel Pickerelweed (Pontedria cordata) emerges to bloom in Dyke Marsh in the spring. Photo by Glenda Booth weed emerge from the muck to bloom. On a snowy March 21, sharp-eyed FODMers Jennifer Smith and Laura Sebastianelli spotted four Wilson’s snipes in Dyke Marsh west. Given the birds’ cryptic coloration and secretive nature, they can be hard to see. Ed Eder photographed red-necked grebes and beautiful, returning wood ducks in early March. We think there are three active bald eagle nests in the preserve. 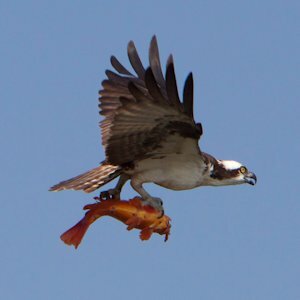 The eBird website lists the Dyke Marsh Wildlife Preserve as among the top ten eBird “hotspots” in Virginia ranked by number of species reported in eBird for all years. The other nine are all on the Eastern Shore or lower Chesapeake Bay “so Dyke Marsh is unique among the top ten,” FODMer Dixie Sommers reported. Dyke Marsh restoration got a qualified “go-ahead” on March 27 when the Virginia Marine Resources Commission approved NPS’s permit application. We discuss this in our article in this issue. We hope many FODMers will help us restore native plants to the cleared land across from Dead Beaver Beach. See our article in this issue. This is an ambitious and long-term undertaking and we need volunteers to give whatever time you can, once or ongoing. We hope that by starting to replace the massive invasive plant infestation, we can create more biodiversity, attract more native insects, birds and other wildlife and enhance our outdoor experiences. Several FODMers made generous donations to buy native plants and we hope more will. Alexandria will soon submit to Virginia a plan to revamp its combined sewer system and stop sending around 11 million gallons of untreated sewage into the river during most rainfalls. Thanks to Dixie Sommers for representing FODM on the stakeholder group. The Potomac Conservancy gave the Potomac River a B grade on March 28, up from a B- in 2016, a C in 2013 and a D in 2011. The report is encouraging but cautions that we have more work ahead. The Conservancy’s Hedrick Belin said, “For the first time in generations, we are within reach of enjoying a healthy, thriving Potomac River. . . It's taken decades of hard work to strengthen water protections and undo the damage wrought by reckless polluters. We're at a critical tipping point and there's more work to be done. Polluted runoff, rapid deforestation and new attacks on water protections threaten to return dangerous pollution to local waters.” The report also cites as problems invasive blue and flathead catfish and declines in tree plantings along vulnerable streams and creeks. Hope to see you at our FODM events and in Dyke Marsh very soon.